You may remember that two weeks ago I attended a Baking Class at Culinary Communion. 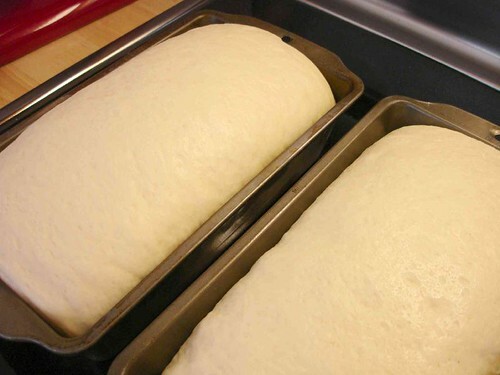 Well, since then the bread baking bug has me – I’ve made pizza and both last weekend and this weekend I’ve whipped up a batch of nice white bread – perfect for toast or sandwiches or just eating on its own. 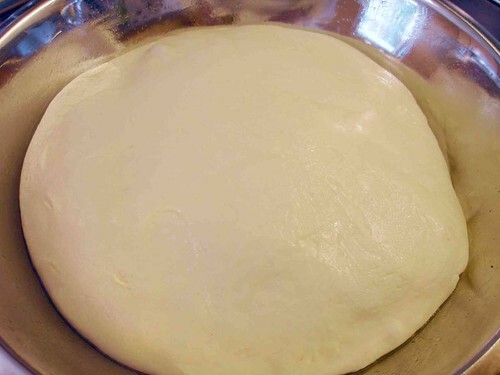 After you get the ingredients mixed together, you knead it for 10 minutes (I let my Kitchenaid mixer do the work) and then place the dough in a greased bowl, place in a warm spot and let it sit for about an hour until it has doubled. Once the dough has doubled you "punch it down" – basically just removing the air pockets that have formed in the dough. 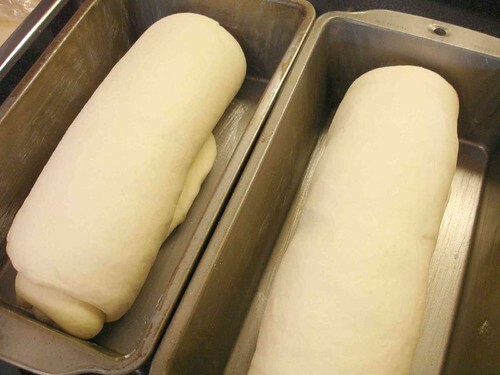 Then, for this recipe, you divide the dough in half and roll each half into a rectangle. The rectangles are then tightly rolled up and placed in the baking pan. It was at this step that I added raisins – I simply spread them over the rectangle before I rolled the dough back up. The bread is then covered and placed in a warm place to rise for about another hour. Last week when I made this recipe I actually started it at night. Once I got the dough rolled and into the pan, I placed it in the fridge overnight. In the morning I pulled it out and let it proof at that time. I let it go a bit longer than an hour to compensate for how cold the dough was. 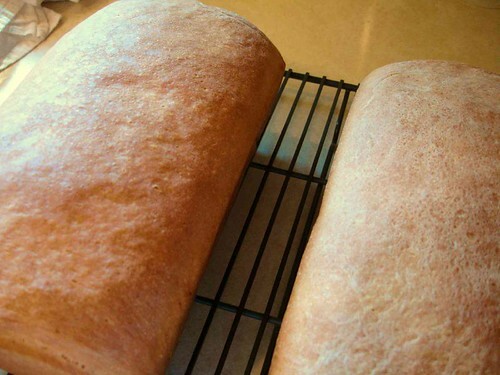 But this allowed me to have hot bread fresh from the oven in less than two hours that morning! Once it has proofed (the second rise). 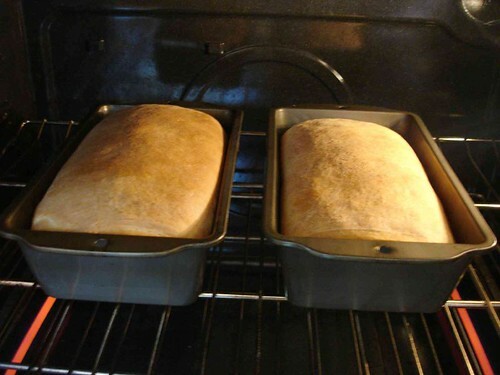 The bread goes into the oven. After 30 minutes the outside is perfectly golden but the inside needs a bit more time, so you cover the pans with foil and then bake an additional 10 minutes. 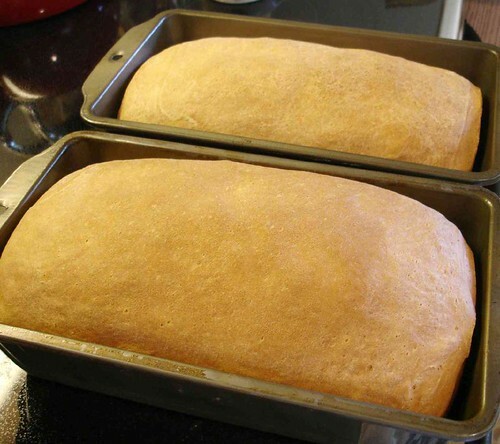 Once you remove the pans from the oven, the bread must be removed from them immediately or it will continue cooking. The bread just glides out of the pan (they were buttered before the rolled dough was placed in them) and onto the rack with no effort whatsoever! At this point you can let it cool or, if you’re like me, after about 1 minute you feel the need to slice into a loaf and check it out! The crusty end with some butter smeared on it is a perfect little snack! 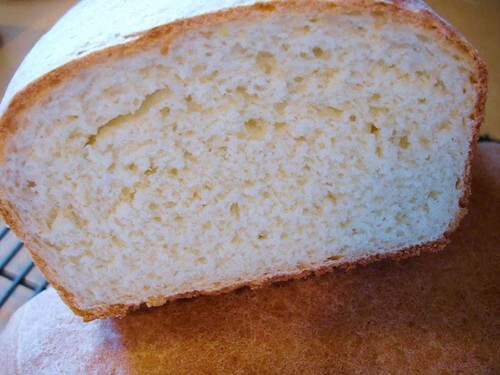 I like this bread as the crust does get crusty, the interior is tender but not airy – it has a little substance to it.